Racing against time, Emily and James rush from clue to clue, desperate to figure out the secret at the heart of Griswold's new game--before those who attacked Griswold come after them too. Write your own clue using a book and local landmarks. Be ready to share it with your classmates. ​​Post your answers to these questions using the Reply form below OR click on "Comment" below the book cover. 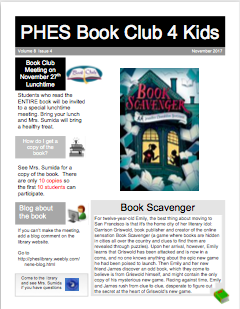 All students who leave a message will be invited to a special luncheon in the library to discuss the book on November 27th. See Mrs. Sumida for a copy of the book.